Community Eye Health Journal » What’s new in age-related macular degeneration? Comm Eye Health Vol. 19 No. 57 2006 pp 04 - 05. Published online 01 March 2006. What’s new in age-related macular degeneration? Consultant Ophthalmologist, Tennent Institute of Ophthalmology, Gartnavel Hospital, 1053 Great Western Road, Glasgow G12 0YN, Scotland. Age-related macular degeneration (AMD) was regarded as unimportant in global blindness, of relevance only to the minority of the world’s population that live in wealthy countries. However, increasing life expectancy, particularly in Asia, has challenged this view. The latest WHO estimates of global blindness suggest that there are over 3 million people blinded by AMD, representing 9 per cent of global blindness. Only cataract and glaucoma cause more blindness. AMD is a disorder affecting people over the age of 55. It affects the macula in the centre of the retina. The macula is essential for detailed fine vision tasks, such as reading and recognising faces. There are two types of AMD, dry and wet. Dry macular degeneration is often asymptomatic. 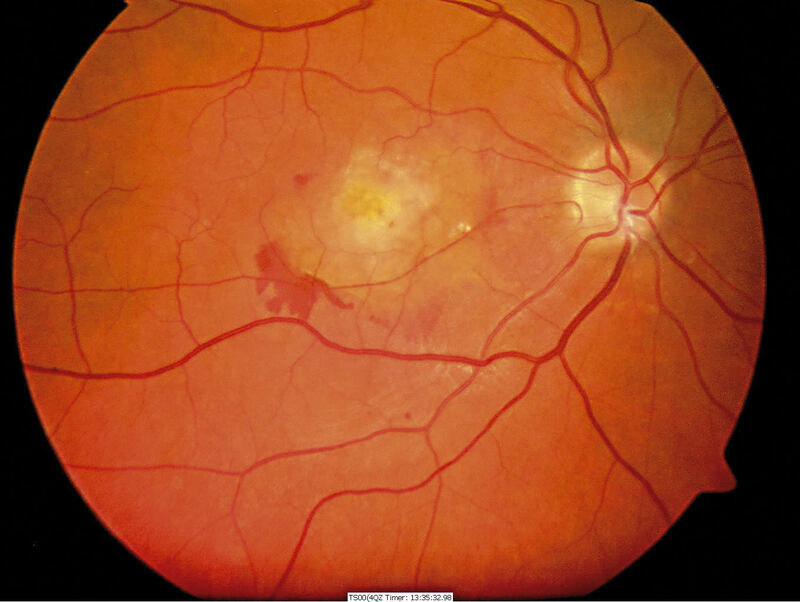 However, patients may progress to vision loss through progressive atrophy of the macular tissue (an advanced dry form termed geographic atrophy). Wet, or exudative, AMD is characterised by a more rapid change in vision due to haemorrhage and fluid leakage (see Figures 1a & 1b). 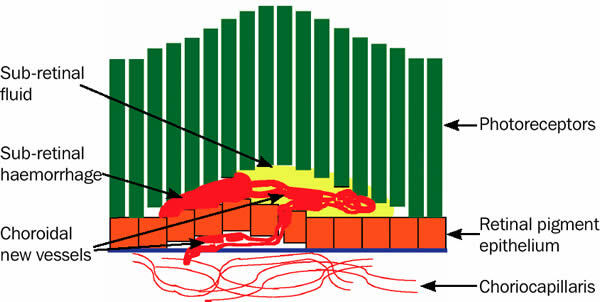 Figure 1a. Normal fovea, showing relationship of photoreceptors, retinal pigment epithelium and choriocapillaris. Figure 1b. In neovascular AMD, blood vessels grow from the choriocapillaris under the retina, causing serous detachment of the pigment epithelium and the retina. Ultimately the vessels are replaced by a dense fibrous scar, leading to loss of the photoreceptors. Wet AMD is due to a fibrovascular membrane growing under the retina. These abnormal choroidal new vessels (CNV) arise in the choriocapillaris, therefore, unlike retinal vessels, they leak fluid. This causes a localised retinal detachment at the fovea (central macula), which may be surrounded by oedema and exudates. 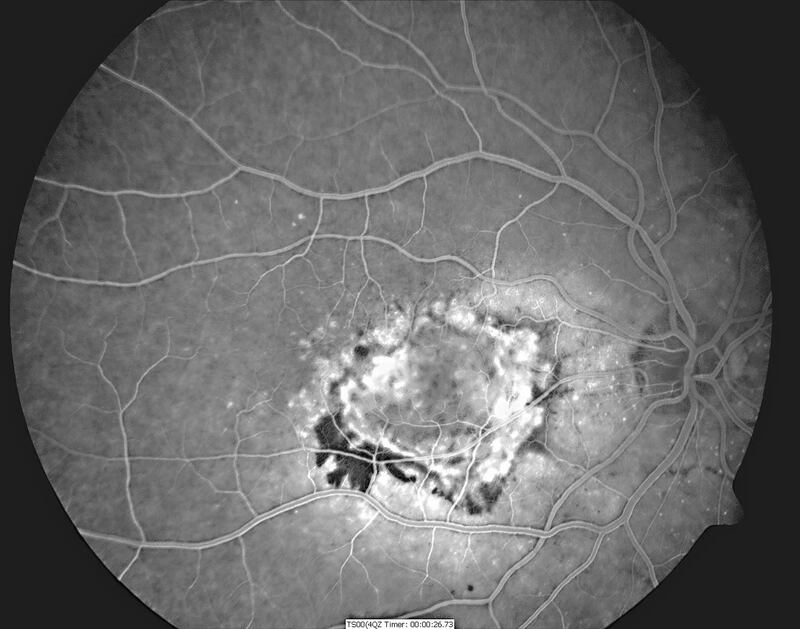 In addition, the blood vessels may rupture causing sub-retinal haemorrhage (see Figure 2). Eventually, the membrane becomes inactive leaving a white fibrous scar under the macula. At this stage the vision is usually reduced to Counting Fingers (CF) or Hand Movements (HM). 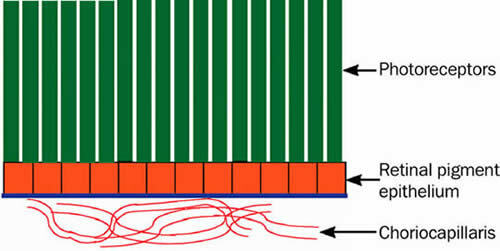 The earliest symptom of AMD is distortion of straight lines. Doorways or window frames may appear bent or twisted – a symptom known as metamorphopsia. This is caused by the small blister of fluid under the fovea. Later, the patient will complain of loss of central vision, and the visual acuity will be reduced. Unlike in cataract or glaucoma, only the central vision is affected, so most patients are able to navigate unaided. On examination, it is often possible to see the elevated fovea, and there may be sub-retinal haemorrhage and hard exudates as well. These are much easier to detect using a biomicroscopic lens, such as a 78 or 66 dioptre lens. This gives a stereoscopic view of the macula, which is not possible with a direct ophthalmoscope. The definitive investigation is fluorescein angiography. Fluorescein dye is injected intravenously, and as it circulates around the eye, a series of photographs are taken of the retina using a blue light to illuminate the retina. The fluorescein then emits green light, which is detected by the camera. Unlike normal retinal blood vessels, the CNV leak fluorescein, and this can be seen as a bright area in the angiogram photos (see Figure 3). The fibrovascular membranes are classified as either ‘classic’ (well-defined on fluorescein angiography), or ‘occult’, if leakage is seen but the membrane is not well-defined. New digital fundus cameras, which are expensive to buy but have very low running costs, are making fluorescein angiography more accessible. Dry AMD causes a very gradual loss of vision, and is visible as an area of atrophy of the retinal pigment epithelium under the fovea. No one knows exactly what causes AMD, but there have been some important developments recently. Firstly, we know that age is the most important risk factor. The condition is much more common in people aged 80 or over. Unfortunately, we cannot modify this risk factor as we are all ageing. Several epidemiological surveys have demonstrated that smoking is a risk factor for AMD. The link between smoking and blindness is now well known, and this is an important public health message. Smoking one pack of cigarettes per day for 40 years is associated with a threefold increase in the risk of AMD. Even passive smoking is associated with an increased risk, but stopping smoking appears to reduce the danger. Possibly 15 per cent of AMD cases are caused by smoking. Genetic influences are also important. Several recent studies have shown that a variant of the gene that encodes complement factor H (a protein that helps to regulate the body’s response to inflammation) and a second gene, less characterised and located on chromosome 10, are independently associated with AMD. As many as 40-50 per cent of all cases of AMD may be caused by these gene variations. There is no perfect method of preventing AMD. Stopping smoking reduces the risk, but does not abolish it entirely. A large study in the USA showed that taking high doses of vitamins A, C, and E, combined with zinc supplements, significantly reduced the risk of progression in AMD. The treatment was protective against CNV, but had no clear effect on geographic atrophy. The supplements are most beneficial when used in patients at greater risk of developing wet AMD, particularly patients who already have one eye affected by wet AMD. In these patients, the supplements reduce the risk of developing wet AMD in the second eye by about 25 per cent. Smokers should not use this treatment, as it may increase their risk of lung cancer. It is estimated that in the USA there are 8 million people over 55 who are at risk and that 1.3 million of them are likely to lose vision as a result of AMD over the next five years. Use of vitamin and zinc supplements would reduce this by 300,000, and stopping smoking might reduce it even further. We should ensure that patients at risk have access to vitamin supplements, and should take every opportunity to stress the strong link between smoking and blindness. No treatment has been shown to be effective against geographic atrophy. For many years the only treatment for CNV was laser photocoagulation. This is effective, but, as the treatment destroys the overlying retina, it also results in irreversible loss of central vision; therefore laser photocoagulation is only useful in the 10 per cent of patients with wet AMD in whom the CNV are located away from the fovea. Recently some vision-sparing treatments have become available. The first of these is photodynamic therapy (PDT) with verteporfin. Verteporfin is a drug that only becomes active when exposed to light of a particular wavelength. It is injected intravenously, and then the area of choroidal new vessels is irradiated with a low-powered laser that emits light at the correct wavelength. This activates the verteporfin, and it destroys the abnormal blood vessels under the fovea, without damaging the overlying retina. The results of clinical trials show that the risk of visual loss is halved in patients with a classic (well-defined on fluorescein angiography) membrane. About 60 per cent of the treated patients lost less than three lines of vision after two years, compared to 30 per cent of the patients given a placebo. Unfortunately, verteporfin is very expensive, and treatment often has to be repeated. Even in wealthy countries there has been intense debate about whether this is affordable and cost-effective. All new vessels in the eye, whether retinal or choroidal, grow in response to angiogenic factors – chemicals that promote the growth of new blood vessels. One of the most important is Vascular Endothelial Growth Factor (VEGF). A number of different drugs are effective at blocking the action of VEGF. Unfortunately, because VEGF is useful in other parts of the body, these drugs blocking it cannot be administered systemically and must be delivered directly to the retina. This usually means repeated intraocular injections. The first of these drugs is pegaptanib. A randomised trial comparing intra-vitreal injections of pegaptanib every six weeks with sham injections showed that, after one year, 70 per cent of the treated patients lost less than three lines of vision compared to 55 per cent of controls. The effectiveness of this treatment was not influenced by the type of choroidal new vessel membrane – it worked equally well in occult and classic membranes. Unfortunately, 1.3 per cent of patients given the injections developed endophthalmitis, and 0.6 per cent had a retinal detachment. It is not known for how long the treatment must be continued, but it seems probable that stopping the injections would lead to reactivation of the new vessels. A second drug that is not yet available, called ranibizumab, also works by blocking the action of VEGF. It has shown even more promising results, with less than 10 per cent of patients losing three lines of vision and over 30 per cent gaining at least two lines. Anecortave is an angiostatic steroid which means it does not posses any glucocorticoid action and has none of the usual ocular side-effects of steroids, such as elevated IOP or reduced immunity. It is being evaluated both for the treatment and prevention of wet AMD. Anecortave can be given by sub-Tenon’s injection and a treatment may be effective for six months. A recent clinical trial compared sub-Tenon’s injection of anecortave to PDT with verteporfin. In both treatment groups, about 45 per cent of patients lost less than three lines of vision. The injections must be repeated every six months, but appear to be very safe. Because PDT was used in the control group, all patients had classic membranes, so there is no information on the effectiveness of anecortave in occult membranes. We are awaiting results from more clinical trials. Although PDT, pegaptanib and anecortave are all effective at reducing the rate of visual loss, they are not a complete cure. They significantly reduce the risk of blindness, but do not restore normal vision. In most trials, success was defined as loss of less than three lines of vision, so an eye that dropped from 6/36 to 6/60 after treatment would be regarded as a success, although the patient would still have poor vision. The alternative to medical treatment is surgery. Although no large trials have been carried out, retinal translocation appears to offer some hope to patients who develop CNV in their second eye. The principle of this operation is that the CNV are a response to abnormalities in the retinal pigment epithelium and choroid, but the overlying macula is initially healthy. If the macula could be moved to another part of the retina, with healthy pigment epithelium, it would regain its function. This is achieved by a pars plana vitrectomy, after which the retina is then completely detached by injecting saline under the retina through a 40 guage needle. Once the retina is detached, a 360 degree retinotomy is carried out just behind the ora serrata. The CNV membrane can then be picked up and removed with fine intraocular forceps. The retina is only attached at the optic disc, and it can be rotated by about 45 degrees, so that the macula now lies over healthy choroid. The retina is re-attached by filling the vitreous cavity with silicone oil. After three months, the silicone oil is removed and the superior and inferior oblique muscles are adjusted so that the eyeball is rotated in the opposite direction and the macula is once again at the centre of the visual axis. This is very complex and costly surgery. However, in the largest series to date, the median distance visual acuity improved from 6/36 to 6/24, and reading vision improved even more, with the median reading speed increasing from 71 to 105 words per minute. Despite our best efforts, many patients will be left with profound visual loss. Although this may not be curable, we can still help by providing low vision aids, and social support. Peripheral navigational vision is usually preserved, so mobility training is not usually required. However, poor reading vision may be very disabling, and although magnifying low vision aids are unlikely to improve vision enough to read a book, they allow the patient to read prices in the market or headlines in a newspaper. As the world’s population ages, we will face an increasing challenge from AMD. Although there have been some very significant advances in our understanding of the causes and treatment of AMD, we are still a very long way short of a cure or an effective prevention.